It seems like you can't bathe a child without having to have bath toys. However, it can be a major problem trying to figure out what to do with those bath toys when you are not actually using them in the bath. This product is actually one of the two main solutions you can use. It is a basket which fits over your bathtub to hold the toys while not in use. It also has a couple of dividers, so you can actually use it to store other things too, such as shampoo or body wash within easy reach while you bathe your child. The other solution for storing these toys for the tub is actually a wall mounted storage bag. Both have their advantages and disadvantages, which is why I have featured both types of products, so you can make the best choice for you. The disadvantages to the basket, like this one, is that it can get in your way while you are actually bathing your child. I actually have one that is similar to the one featured (although not exactly, since I bought mine many years ago now), and we actually just move it out of the tub during the actual bath, and then just place it back when we are done. The advantage of this basket, as opposed to the bags, is that it is much less likely to just fall down. Further, the fact that it is plastic means that it will not begin to have too much of a smell the way certain fabrics do, if they stay wet too long. If it does begin to develop any mildew or mold just wash it with hot water, soap, and a bit of bleach, and it is good to go again. 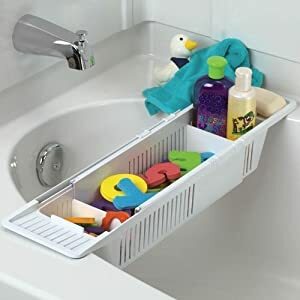 I also like that it has slotted sides, because this allows the water to drain from the bath toys so they are less likely to get yucky with time. You can see even more bathroom storage solutions and organizer product recommendations and ideas. Join in and write your own page! It's easy to do. How? Simply click here to return to bathroom storage solutions.